PracticeLink.com W INTER 2018 61 the Q uality of life issue p Lynnette Morrison, M.D., went on her first medical missions trip in 2011—and has traveled with IMR five more times since. · Photo by Stephen Ironside See this issue's physicians in exclusive video interviews at Facebook.com/PracticeLink want to have sustainable solutions for the communities that we serve," explains King. "We have long- term solutions with short-term opportunities." This f lexibility allows many physicians to work with IMR who would not otherwise be able to serve abroad. "I've talked to colleagues that have said, 'I really want to go, but I don't have the time,'" says Morrison. "I would say, 'Go on one. Just go on one. It doesn't matter where. Just go on one and have that experience.' It's very good to go somewhere that's out of your comfort zone. You're going to see things that'll help you practice." For more information about serving with IM r , visit internationalmedicalrelief.org. i nterested in medical missions? If you're job searching and interested in volunteering, mention your goal to employers — and follow these tips. Ask about it when you interview. 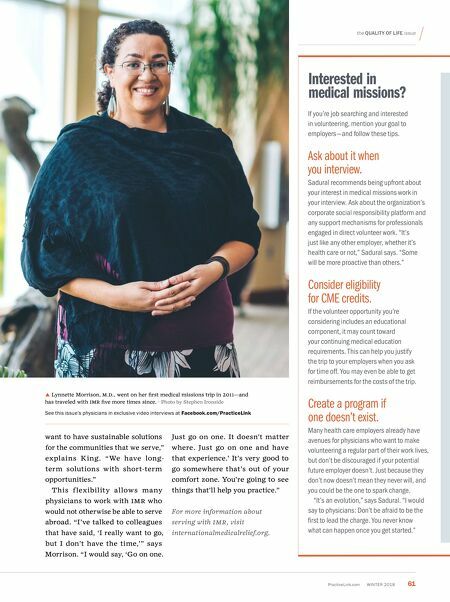 Sadural recommends being upfront about your interest in medical missions work in your interview. a sk about the organization's corporate social responsibility platform and any support mechanisms for professionals engaged in direct volunteer work. "It's just like any other employer, whether it's health care or not," Sadural says. "Some will be more proactive than others." Consider eligibility for CME credits. If the volunteer opportunity you're considering includes an educational component, it may count toward your continuing medical education requirements. This can help you justify the trip to your employers when you ask for time off. You may even be able to get reimbursements for the costs of the trip. Create a program if one doesn't exist. Many health care employers already have avenues for physicians who want to make volunteering a regular part of their work lives, but don't be discouraged if your potential future employer doesn't. Just because they don't now doesn't mean they never will, and you could be the one to spark change. "It's an evolution," says Sadural. 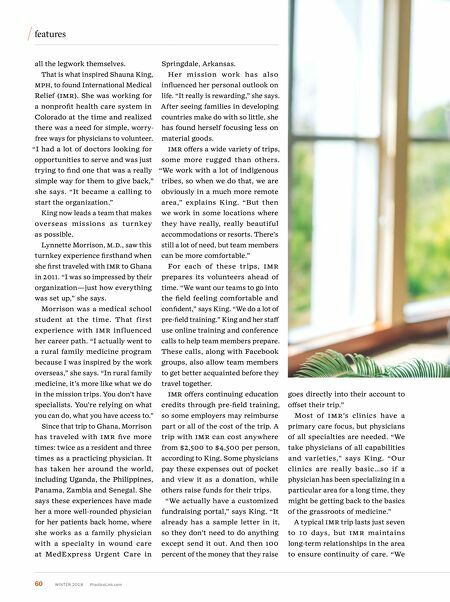 "I would say to physicians: Don't be afraid to be the first to lead the charge. You never know what can happen once you get started."